It’s freezing outside (trust me I’ve been biking to work most days), but the weather forecast is looking sunny for tomorrow! We are on schedule for our monthly Guild meeting in Newton at the Harvey County Courthouse (7th & Main Street) at 6:00pm! We have a full program, including Dee who will be demonstrating Moebius Knitting followed by a lively discussion on Podcasts and other Internet Resources available to fill your knitting needs. Join us…please see the previous post below about items to bring! 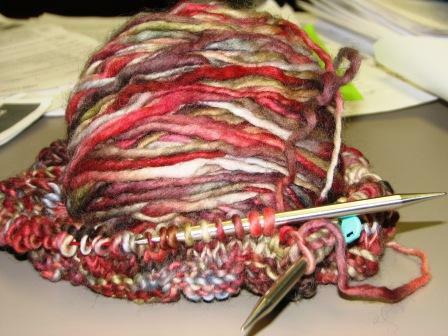 And, if you don’t have a current project you have been knitting on…go stash diving and pull out something half done! Instant Show & Tell! As you can see, I just couldn’t wait to cast on something moebius…especially with the weather outside! This is from my DEEP STASH…we’re talking 5+ years of fondling this poor skein! PS-We will post on our Blog, FB, email and Ravelry by Noon tomorrow if the weather looks poor.